A grieving mother has pleaded for witnesses to come forward about her son's death. Melanie Staple said she had found it "really hard" since Fidel Glasgow was stabbed to death outside Club M in Coventry on 1 September. 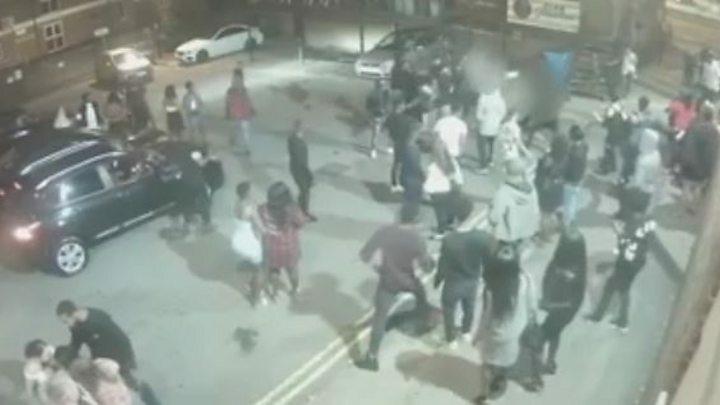 West Midlands Police has released CCTV from outside the club on the night he died in a renewed appeal for information. A man arrested on suspicion of murder was released without charge. The 23-year-old from Coventry was arrested in September. On Friday, Ms Staple, 42, repeated the family's call for witnesses to come forward, as the footage showed huge crowds outside Club M when Mr Glasgow was injured. "There were a lot people there so I know there is someone out there that knows something," she said. "They have got to come forward." Mr Glasgow - the 21-year-old grandson of Specials singer Neville Staple - was found injured at the rear of the club in Croft Road and later died in hospital. The club has since had its licence removed. Officers said they have already spoken to several witnesses. Det Supt Matt Markham said: "Several people were seen running after one man who was attacked, and it was during this violent disorder that Fidel was fatally wounded. "We know there may be people who saw something, but feel it may not be significant enough to report it. Please let us be the judge of that." Mr Glasgow's paternal grandfather, Michael Anderson, 58, said: "I am seeing a lot of people that is recording, there is a lot of people videoing. "It is Christmas now, and no-one has come forward. Why?" One man has appeared in court in connection with Mr Glasgow's death. Atikou Diallo, 23 of no fixed address, denied wounding with intent and robbery at Birmingham Crown Court on 5 November and will face trial on 19 February.